If you are anything like me, the first words that come to your mind are (in abbreviated form), "WTF?" Now, lets call a spade for what it is. The Pakistan squad for the World Cup has had to deal with, what one would describe as, extremely tumultuous events over the last month. If the uncertainty around the omission of Shoaib Akhtar and Mohammad Asif, due to err... injury related reasons wasn't enough, a fire (or was it just smoke??) tore through their hotel forcing many star players to scamper out into the open. 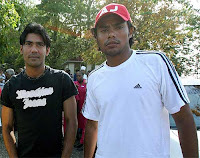 Apparently, while the players were standing outside Danish Kaneria was asked to verbalise his views on the commotion. He replied with a simple, "it happens" (presumably with a shrug of the shoulders). The dimwit journalist subsequently quoted Kaneria as having said, "it happens at home as well." My initial reaction was that it must have been a reporter from Tehelka. The Pakistani management has seen this event as reason enough to ban all players from speaking in English for the duration of the tournament. It just happens to be "National Tourist Year" in Pakistan at the minute and the team management (likely after a stern call from President Mushy himself) is concerned that misquotes might result in a less-than-positive reputation for their country. This logic is partially understandable, even in a cricketing context. After all, you wouldn't want Mohammad Sami answering a question on whether he also takes drugs by confidently offering, "it happens" - even if it is accompanied by an exaggerated shrug of the shoulders. However, we all know that there has never been a Pakistani cricket announcement without a bizzare twist. The Pakistani management is of the firm view that their players speaking Urdu in press conferences will entice foreign tourists to Pakistan. To be honest with you, I do not know one non-subcontinental friend of mine that will visit another country for the sole reason that its people do not speak English. I am still scratching my head at this warped logic. Then again, it is Pakistani cricket and if we can't expect the weird and the wonderful from them, where will we source our entertainment from?